The HP Compaq 6515b is a solid, nicely outfitted notebook that, while falling into the thin-and-light category, is pushing close to the maximums, in my opinion, when it comes to weight and size. Nonetheless, no sacrifices have been made in terms of build quality or business features. The matte screen and keyboard are excellent, and the notebook offers a lot for the price. Performance could be better, but that’s almost always true, and for most typical business and personal computing, performance should be plenty; there was no significant lag under stress and the 6515b easily handled Vista Business, including Windows Aero Glass. The 6515b was a pleasure to use and, as expected, performed much better than the still very serviceable nc6120s I’m used to. Bottom Line: The HP Compaq 6515b is a business laptop with plenty of wireless features, but competition from Lenovo and Gateway makes it a tough sell. Pros: Plenty of wireless options to choose from. Laminated palm rests. Good features. Cons: Pretty thick. Mediocre performance scores. The good: Improved design; antiglare display with sharp resolution; options for 802.11 draft-n, EV-DO, and HSDPA wireless; great-sounding speakers; strong components for the price. The bad: Lagged on Office productivity test; has somewhat heavy travel weight; lacks an ExpressCard slot. The bottom line: The HP Compaq 6515b notebook computer offers enterprise-level features and decent performance at a price that's friendly to small business. 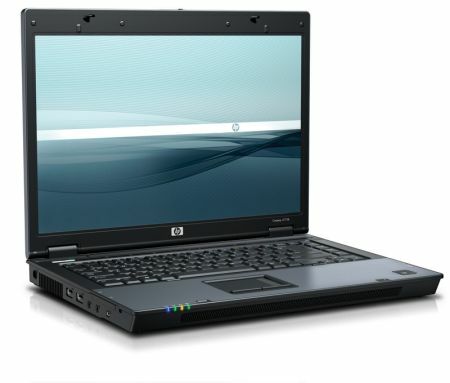 Although it's not the fastest or longest-lasting business notebook, the HP Compaq 6515b delivers good productivity performance and mobile broadband--at least on the downlink--in a durable and affordable package. It's a solid choice for small-business customers on a budget. Packing mobile broadband and a host of security options, the HP Compaq 6515b lets mobile workers stay connected and protected at a reasonable price.